The purchase of the Sunday Times by Rupert Murdoch in March 1981 brought a change of political climate at the paper. In Harold Evans' office Murdoch saw a Gerald Scarfe caricature of Ronald Reagan, showing him as Mickey Mouse with a gun, marching out of Vietnam and into San Salvador. 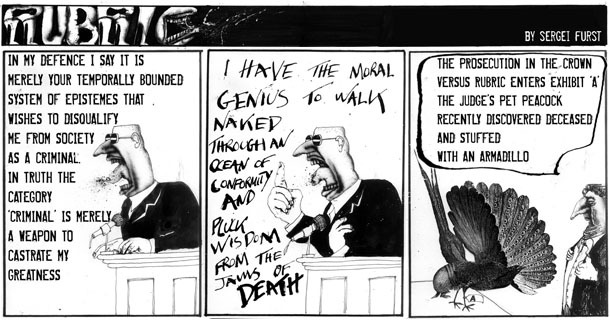 Murdoch observed "Poor old Ronnie – We're going to have to get rid of this pinko artist", but Scarfe managed to remain. "Rubric was omitted due to lack of space. He does, however, wish to thank all those who wrote in enquiring as to his whereabouts. – Ed." Boiling with the blisters, Rubric has few if any equals in the world of comics. 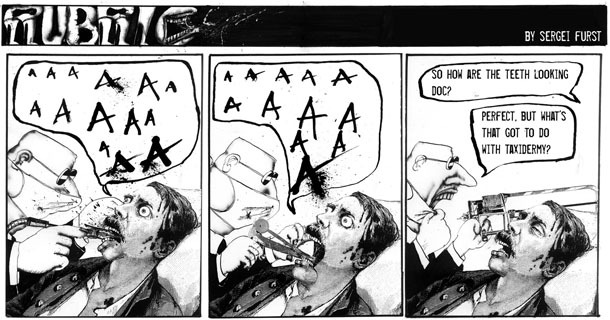 You'll look in vain for its presence in any of Paul Gravett's or Roger Sabin's accounts of the medium but then the strip is too good to be lodged in their sanitised histories. There is, however, a place for Rubric's corrosive humour at Savoy, so we're proud to announce that Sergei Furst has agreed to host his unique creation on the Savoy website. Strips old and new can now be found in the comics section on a page that will be regularly updated. Picasso once said that good taste is the enemy of creativity; Rubric's wit is inventively vicious and happily untouched by the cold, dead paw of anodyne propriety. We hope you find this edifying. See also Sergei's artwork at his new website. "Hey folks, it's an obvious fact, we're at the End Of The World. Life as we KNEW it, is over.... 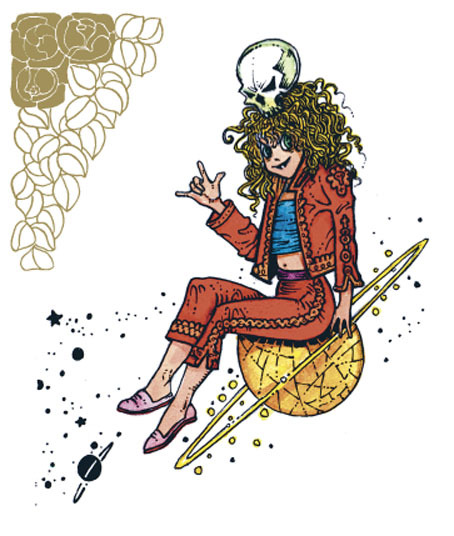 So we need a Bit of Yesterday to get us through this Robotic-Time-Warp-Blip.... Not a legend of Yesterday, but a Prophet/Priestess of Tomorrow, a 21st Century Axis Sally/Tokyo Rose Goddess of Audio Art and Noise Illusion!... Fenella Fielding's delivery of these titles places me squarely at the foot of her bed, on my knees, in a position of worship!" Approach this album without prejudice and you'll be rewarded with a handsome, off-kilter listening experience. 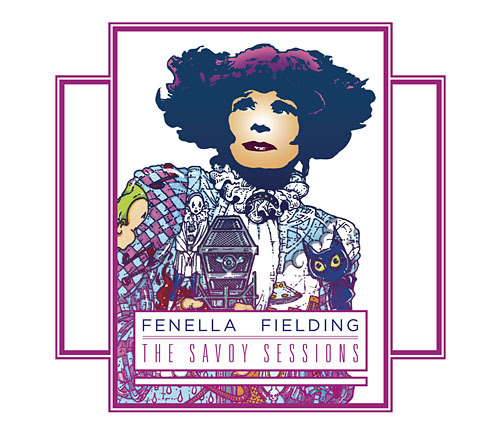 Following Savoy's earlier iconoclastic recordings with PJ Proby, Fenella Fielding enters the studio to shine a surreal light on anthems prized by generations of music listeners. 'Blue Monday', 'Rusty Cage', and others are given intense and hard-edged interpretations that take Ms Fielding far from the typecasting of her 'Carry On' reputation. La Squab by David Britton represents a departure from the author's reputation as the creator of Lord Horror, the last novel to be banned in Britain. Masquerading as a book for children, the primary inspirations of La Squab are The Wind in the Willows—if Grahame's classic had been re-written by Adolf Hitler!—and the 'Fudge & Speck' comic strip created by celebrated Beano cartoonist Ken Reid. At once loony and dangerous, La Squab relates a picaresque river journey down a Thames whose metaphysical qualities exist only in Mr Britton's imagination. Along the way, favourite children's characters such as Tiger Tim, Angel Face and Weary Willie & Tired Tim are encountered, together with real-life historical figures Alfred Jarry, Sigmund Freud, Leni Riefenstahl, and Lord Horror's treacherous doppelgänger, Lord Haw-Haw. The final destination is a submerged Auschwitz conjured afresh beneath the mighty Thames. 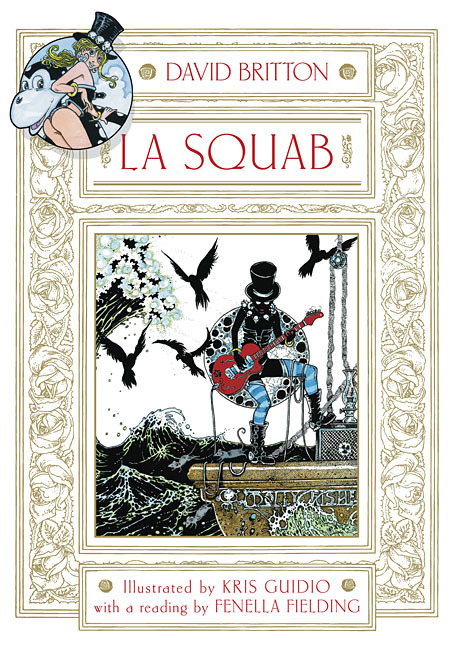 There La Squab's playful romp through literature and topsy-turvy morals reveals that all is not always well in the end! • • • La Squab sets sail! Coming soon from Savoy, a new novel by David Britton. Illustrated throughout by Kris Guidio, and with a reading by Fenella Fielding.